Noah Mitchell Jackson, 19, arrested Feb. 20 in Orange County. Thanks to the diligence of San Diego Police Department detectives, law enforcement agents have arrested key suspects in the 2 unsolved murders that have shadowed Ocean Beach and Point Loma for too long. The communities of Ocean Beach and Point Loma are breathing a collective sigh of relief. But 44 years ago today – February 22nd – it was a different story in OB, a day when the community became an armed police camp; more of that later. When praise is deserved – like today – we are first in line in thanking the detectives who kept on these cases. Matthew Sullivan, the husband of Elizabeth Sullivan – a Point Loma Navy spouse and mother, missing since 2014 and whose body was found in 2016 – was arrested for her murder on January 31st outside his home in Delaware and extradited back to San Diego, where he sits with $2million bail over his head. Details surrounding her disappearance and subsequent discovery of her body in 2016 floating in San Diego Bay right off Point Loma demonstrate husband Matthew should have been a suspect right away. Noah Mitchell Jackson, 19, a local, was arrested for the stabbing death of Walter “Ras” Riley last June 22nd in Ocean Beach. He was arrested in Hunting Beach in Orange County on Tuesday, Feb. 20th, and currently is also being held on $2 million bail in San Diego. Jackson is supposed to be arraigned today, Thursday, according to earlier press accounts. We’ve learned a few more details about Jackson and his arrest, from a San Diego Union-Tribune piece by Teri Figueroa. Of course, we believe both Sullivan and Jackson deserve the presumption of innocence; yet both of them are already weighed down by the little facts we know. And again, the communities affected by the murders of innocents like Elizabeth Sullivan and Ras Riley need to be deeply appreciative of the hard work put into these cases by the detectives. It puts a rose at the end of the long saga of police and community relations experienced in Ocean Beach over the decades. And in the spirit of building on that dialectic, we offer here – again – the story of February 22nd, 1974 – 44 years ago today. Police Swat Team on Abbott Street, 1974. Editor: The following was originally published February 22, 2009, and just about every year we repost it to remind the different generations of OBceans of some of the rich history that makes up the fabric of Ocean Beach, whether one likes it or not. Here’s the history lesson, with only the number of years edited. OCEAN BEACH, CA. Exactly 44 years ago today, on February 22, 1974 – all hell broke loose in Ocean Beach – and for many of the seventies generation, this day will always live on in their memory as a day of infamy – the day the world came crashing down on our little seaside community. It was the day that Pete Mahone, a politicized ex-convict and member of OB’s anti-Vietnam war community, tried to commit suicide by cop. It was also the breaking point in police-community relations, relations that had been simmering for years. 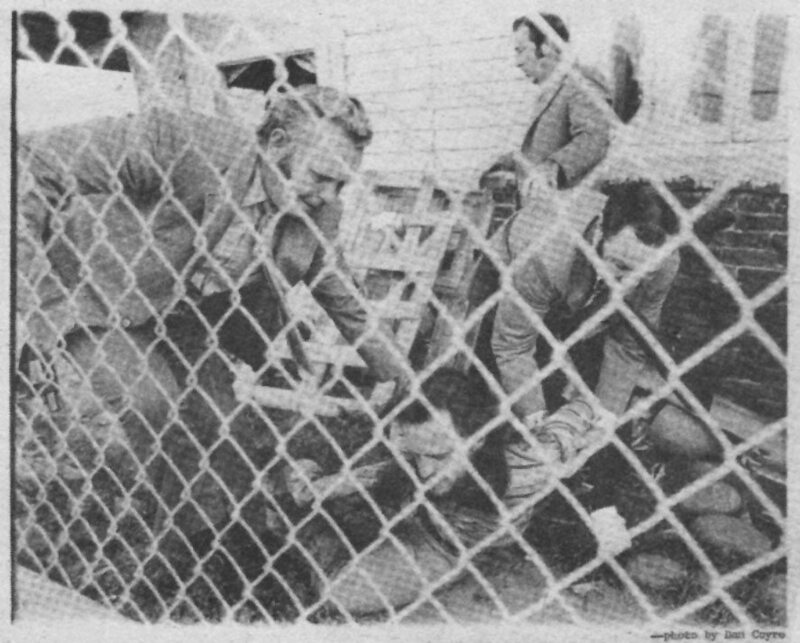 San Diego police officers subdue and arrest Peter Mahone in the front of his Abbott Street cottage, Feb. 22, 1974. On this day, 44 years ago, Pete calmly walked up to San Diego police officer William Ritter who was sitting in his car while parked in the OB Pier parking lot, pulled out a hand gun and opened fire once through the window in the direction of the officer. A soon as he had made his shot, Pete calmly walked back to his little beach shack along Abbot Street and waited. He knew what was to come. Fortunately and miraculously, the officer -at the moment the gun went off – had turned his head and had opened his mouth. The bullet entered his mouth, chipped a tooth and exited through the back of his neck. Ending up only with a flesh wound, Officer Ritter was well on his way to recovery a month later. As he waited in his little cottage on the 2000 block of Abbott, Peter Mahone anticipated that the cops would come rushing through his door. Over the course of the next few hours, police officers did that, but much, much more. On February 22nd, 1974, Ocean Beach became an armed police state. … police units from all over San Diego converged on Ocean Beach. Suddenly the community was under siege. A com­mand post was set up at Robb Field, a helicopter from the county Sheriff’s department was called in, and uniformed and plain-clothes police officers be­gan detaining and questioning people. Throughout the take-over of Ocean Beach by police that day, numerous people had been harassed and arrested, as the Rag recounted. All 4 arrests of bystanders were thrown-out. Two of those arrested had been activists and friends of Peter Mahone. Peter Mahone somehow survived. Officer Ritter survived. Detective De Bruler, wounded by friendly fire, survived. But did the community? The history of this day is an important day in OB’s history, because it brought the community together, the tensions between police and the community came to a head – and led to their resolution months later, as importantly, this day ignited a community-wide campaign for police reform. 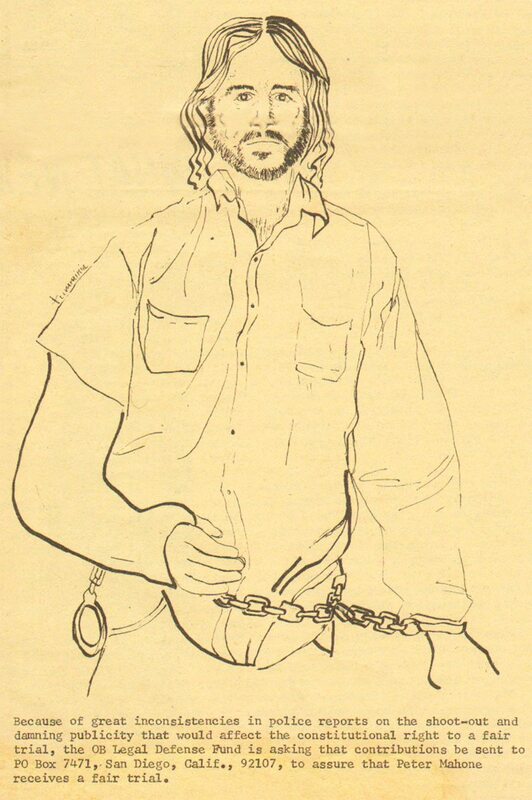 Drawing of Peter Mahone by Diana Tuminia, Ocean Beach 1974. Peter Mahone was charged with 5 counts of attempted murder, 5 counts of assault with a deadly weapon, and possession of a gun while on parole, and his bail was set at $200,000 – which 35 years ago, was a lot of money. After the shoot-out and the turmoil that followed, Peter became somewhat of a cause celebre within the activist community. While no one condoned what he did, friends and fellow activists strove to understand what made him do it. A Defense Committee was set up immediately, which aided him in obtaining legal representation and covering some of his legal costs. Older than most of the other OB anti-war and community activists, Peter had been institutionalized for much of his life, for petty crimes and burglaries. During his later days in prison, he had become politicized – like many inmates had during the heady days of the late sixties and early seventies. He got out of prison in the early 1970s and on parole. He had enrolled in a college program at San Diego State for ex-cons. At State, he met radical professor Peter Bohmer and other activists – many of whom lived in OB, as OB provided a veritable safe haven for radical, anti-war and hippie ways and politics . So Mahone moved to the beach and became active in the movement to stop the Vietnam war. In the Spring of 1972, during a particuarly horrible intensification of the war by President Nixon, the anti-war movement all over the country intensified its efforts to bring the military conflict to an end with more and more militant tactics. Anti-war demonstrators had blocked traffic on I-5 in downtown San Diego. Activists rallied and burned trash cans along Newport Avenue. Protests occurred across the country. Up in North County, right outside Del Mar, an anti-war rally was held. Protesters had built a pile of timber on the railroad tracks that run along the Pacific Ocean and lit it in an effort to block a train carrying war munitions to San Diego to be shipped to Viet Nam. Police arrived in force, and arrested a number of people, including Peter Mahone, and his mentor Professor Peter Bohmer, along with another well-known OB community activist. In all, 3 Ocean Beach residents were arrested at this protest, and included in what was later called “the Del Mar 4”. Months later, during the preparation for the defense of the Del Mar 4, it was discovered that police informants had infiltrated the defense team – a clear violation of the Fifth and Sixth Amendment rights. When lawyers for the defendants tried to have the charges thrown out due to this usurpation of civility, the judge ruled against the activists. Peter Mahone never quite got over this legal defeat. This arrest brought him other police harassment back in OB. In time, he started taking hard drugs and becoming very paranoid and delusional. Fellow activists who were his roommates became uneasy with his behavior, and watched him become unstable. About a month before the February shoot-out, his roommates had asked him to leave. They couldn’t handle his paranoid and strangeness. One roommate had come home to find the telephone busted up and in the trash. Another day, a paper-cutter had been destroyed, and Peter saved the handle to protect himself. Mahone finally went to trial and was convicted of some of the charges. A number of friends had testified at his trial to his instability leading up to the shooting. Nevertheless, he ended up back in prison for some ten or so years. Out of prison once again, he lived in the Bay Area, where he came into contact with former OBceans living in that area. It is believed that Peter died in 1993. So ended the Peter Mahone saga. But the community of Ocean Beach was changed forever by what he did on February 22, 1974. More to come in the next installment in this OB History Lesson. “bail will remain as set at $2 million,” ruled Hallahan after attorneys submitted the bail issue without any arguments about bail. Deputy District Attorney Michael Reilly said Jackson faces a maximum sentence of 26 years to life if he is convicted of first-degree murder. Attorneys did not go over the facts in court about the June 22, 2017 slaying of Riley, who was stabbed repeatedly around 12:30 a.m. in the 1900 block of Bacon Street. A preliminary hearing was set for March 8. Reilly said it would likely be delayed at another hearing on March 6. It was given a time estimate of one day. 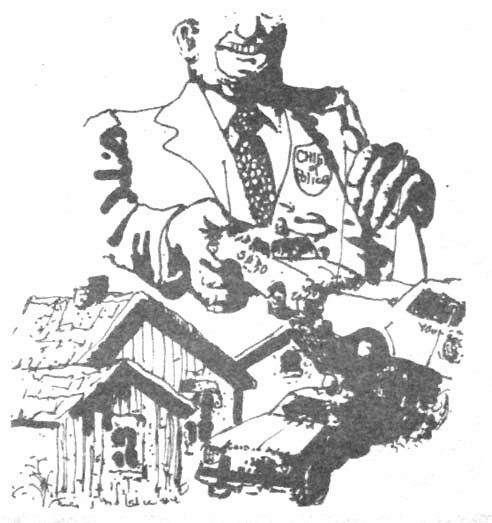 One of the things that made community organizing in the 1970s in San Diego was the police chief, Ray Hoobler. Hoobler was a particularly aggressive, confrontational chief, who didn’t like African-Americans, Chicanos, gays and lesbians, dirty hippies, radical hippies and particularly radical anti-war hippies.